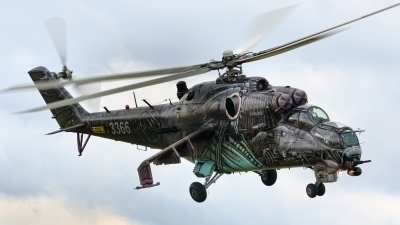 Tiger Puma from 230. sq. / RAF station Aldergrove is seen on static display during 23. zVrl (hel.AFB) open day / Mini Tiger Meet 2005. (Scan from negative film). 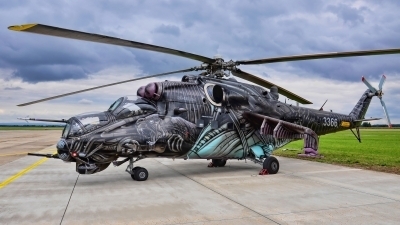 "Alien Tiger" from 221. vrl (hel. sq.) / 22. zVrl (hel. AFB) Namest n/O. is captured during Day of airport Prerov 2016. This c/s won the trophy for the best painting on NTM 2016 at Zaragoza. 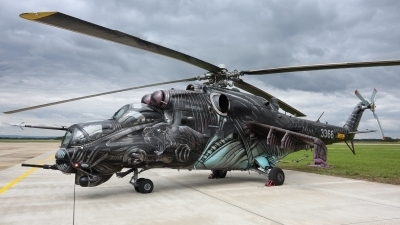 "Alien Tiger" from 221. vrl (hel. sq.) / 22. zVrl (hel. AFB) Namest n/O. is captured during solo display at Day of airport Prerov 2016. This c/s won the trophy for the best painting on NTM 2016 at Zaragoza. 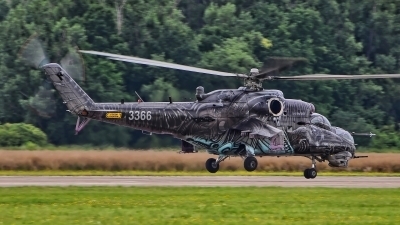 "Alien Tiger", a new flagship of the 221st Helicopter Squadron from Namest nad Oslavou AB, designed for NATO Tiger Meet 2016 at Zaragoza. 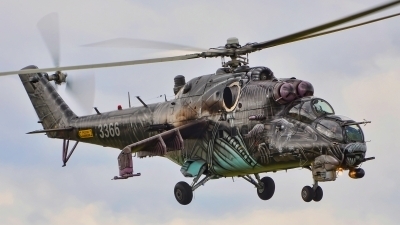 On picture is seen during a small airshow at former 23rd Helicopter Base in Prerov-Bochor. 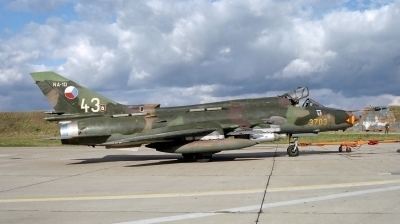 Su-22M4 (2218) from 321.tpzlt / 32. zTL at Namest AB is modifications which allows the use of KKR-2 recce container. In 1984 was assigned to 47.pzlp and initially is designated as "2718". 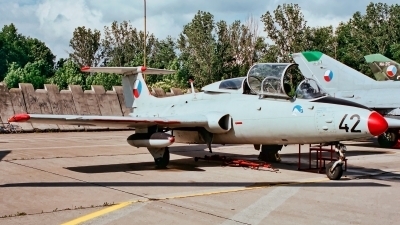 In 1995 overhauled in LOT Trencin, 2002 WFU and 2010 sold to Yemen. W-3A Sokol (0715) from 334.ldsvr / 33.zVrL at Prerov AB. 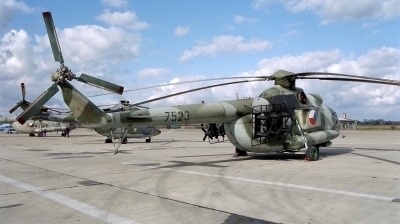 In 2000 was modified for LZS (SAR) missions, in 2009 overhauled and acquired a new white-red paint. (Scan from 35mm negative film). W-3A Sokol (0713) from 334.ldsvr / 33.zVrL at Prerov AB. At this time "0713" were not equipped with a searchlight Spectrolab SX-16 Nightsun 1600W. (Scan from 35mm negative film). 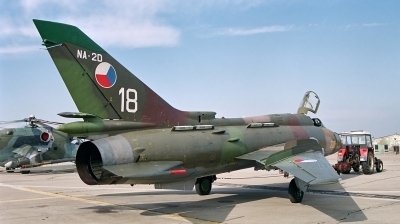 Su-22M4 (3703) is towing away into the hangar of 32.LOZ (aircraft maintenance) at Prerov AB. "3703" was withdrawn from Czech AF in 2002, subsequently in 2010 sold to Yemen and undergoes a overhaul at Baranovichi (Belarus). (Scan from 35mm negative film). 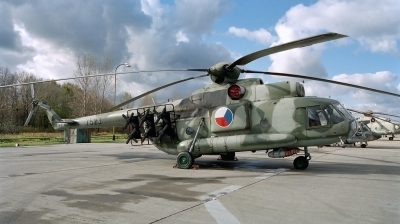 Czechoslovak AF served only three Mi-8PPA with Nr. 7520, 7522 and 7523. 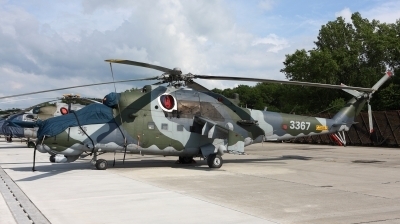 Helicopter was equipped with a "Azaliya" jammer suite (comprising two SPS-63 jammers and a single SPS-66) and SPS-5M2 "Fasol" noise barrage jammer. (Scan from 35mm negative film). 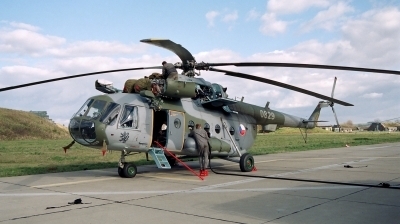 A special REB modification Mi-8PPA (7523) from 334.ldsvr/33.zVrL at Prerov AB. Initially was assigned to 31.smltvpz at Bechyne AB and in 1993 was transfered to 11.vrp at Line AB. 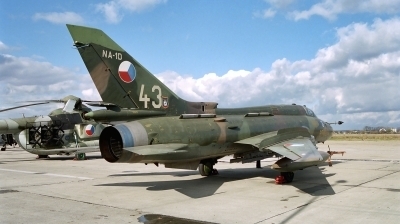 In 2003 withdrawn from Czech AF and now is exposed at Grabstein barracks. 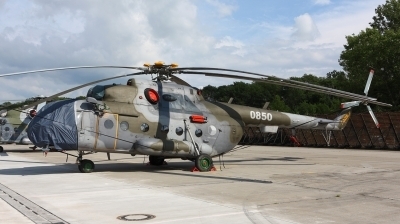 Mi-171Sh (9926) is modification with rear doors. 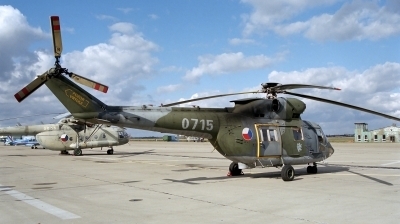 Helicopter was delivered to Czech Republic on 2 December 2005. 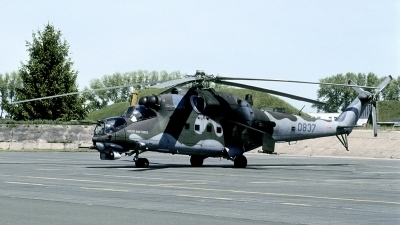 Mi-35 (3368) on south-east apron of Prerov AB. On 10 November 2006 year this helicopter had a flying accident (bird strike) near Arnolec village. 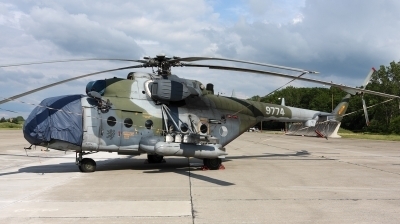 A "heavy" Mi-171Sh (9825), which performs tasks of SAR mission for Morava region. In this role replaced a smaller and better W-3A Sokol. A Prerov´s SAR station was located at south-east of hardened shelters area and in 2010 was disbanded. 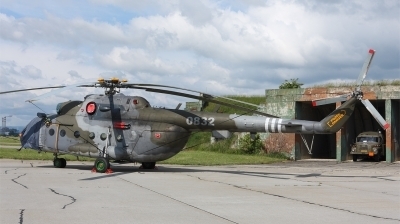 An older Mi-17(0832) is seen on station before car's hardened shelter at SE apron of Prerov AB. 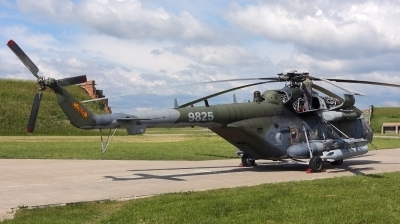 Helicopter was modernized to "SOR" standard and has a SPO-10 antennas, ASO-2V chaff/flare dispensers, large 2520 litres external fuel tanks and other elements. 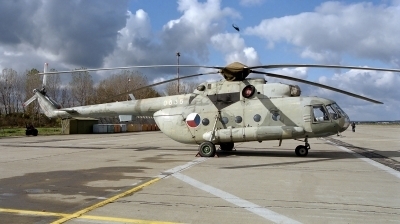 Mi-17 (0850) on south-west apron of Prerov AB. 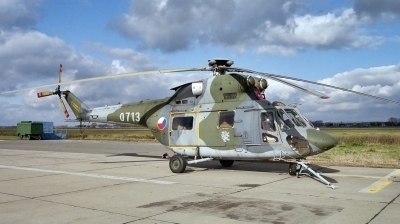 In mid 90´s this helicopter had red-white paint for SAR mission from Plzen-Line AB. 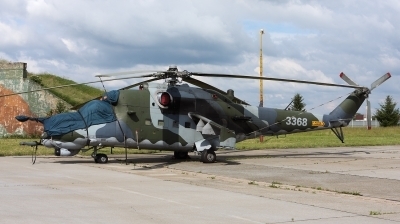 Mi-35 (3367) on south-west apron of Prerov AB during Open Day of the base. 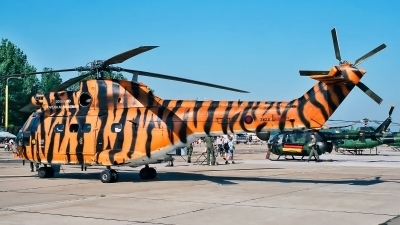 This Hind got tiger stripe under the cockpit of the captain for NTM 2011 in Cambrai-Epinoy. 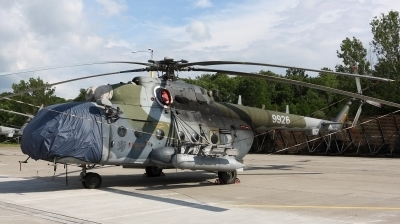 A new Mi-171Sh (9774) with special EVU exhaust cooling system and two standard 450 litres external fuel tanks on south-west apron of Prerov AB. In 2012 year was modernized at LOM Prague company.